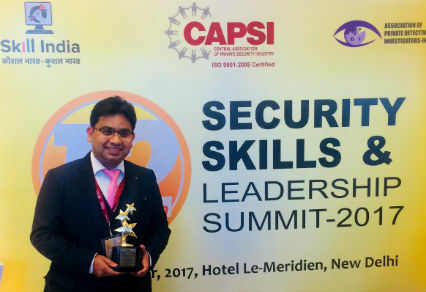 Young Security Entrepreneur of the Year – Mr. Akash Saxena, Director, Topshield Security Services Pvt Ltd.
New Delhi: The 12th Security Skills & Leadership Summit 2017 organized by CAPSI (Central Association of Private Security Industry) and APDI (Association of Private Detective & Investigators) was held at Le Meridian Hotel, New Delhi. Union minister of state for external affairs General VK Singh was the Chief Guest at the valedictory session. Sh Shivraj Patil, former Governor of Punjab, also addressed this summit. The Honorable Chairman of CAPSI & APDI, Kunwar Vikram Singh addressed the members mentioning the strength and the weaknesses of the Private Security industry. He said “the sector currently employs 7.5 million people in 22,000 private security agencies. The current GST regime will collapse the sector financially and that there is a need for amendments of the Private Security Agencies (Regulation) Act in consultation with the security agencies. They urge the prime minister to proactively consider their demands and save the sector which could prove crucial for success of skill India and also in generating jobs”. While at the award ceremony, the most popular and much awaited award for the “Young Security Entrepreneur of the Year” was presented to Mr. Akash Saxena, Founder & Director, Topshield Security Services Pvt Ltd.
“It feels great to be a part of an industry which is thriving each day. And receiving this award is just fulfilling my dream and the power to bring changes that I foresee”, says Mr. Akash Saxena. Topshield Security Services Pvt Ltd.